Just so you know, I now blog now and then here at Tamebay.com the ‘go to’ place for all up to the minute eCommerce news. You can also find me in the Tamebay Guide among some of the best eCommerce solutions on the planet! Are you worried about losing TRS? I wrote a bit on my Facebook page, some positive thoughts for some sellers facing a negative feeling right now! Did you lose TRS status in the UK? Come over and let me know what you think! If you’ve never been to a Meetup then make the Leeds UK Online Seller Meetup on 19 June your first, it’s a stones throw from Leeds train station and there’s plenty of parking there too. What to expect … lots of friendly chat, networking, no hard sell of any products or services, free advice, a couple or three of short but very informative presentations from the industry exports. Food, a few beers and a lot of talking about eCommerce in general. Sponsored by the lovely peeps at iwoca who will help you with some short term pounds to help you grow your business. So if you are worried about eBay’s new spring changes, sales going flat, troublesome buyers or the best way to post a parcel to Russia, there’s a lot of experience in the room whatever questions you have. Dan Wilson (Tamebay writer and ecommerce expert) – The latest industry news: what every sellers should know about. Katy Wilson (Sage Pay) – Turning browsers into buyers: how to optimise your webstore and improve conversions. Willem Rowies (Webinterpret) – Best practice to boost your international sales. Trust me, this event is one that shouldn’t be missed. We look forward to seeing you there! Is the Internet killing the High Street or is the High Street killing itself? On the news this morning (13-1-2014) they were discussing the Sunday newspapers and articles about the amount of business rates being paid by High Street retailers and addressing the balance between the amounts paid by those selling purely on the internet. This following the usual ‘internet taking business away from the High Street’ conversations. I’m neglecting my blog again but… only because I’m doing more on the Facebook Page. If you want to know more about me and what I do, please pop over to the Tamebay Tools and Services Guide and have a read, a few of my wonderful clients have also left reviews. All the best for the coming year and I hope you are up to date with all the happenings regarding the new eBay Search engine Cassini and what it will mean for you and your listings appearance in search. Pop over to read stuff on Facebook, currently discussing the new changes that come into affect on Tuesday 17 September 2013 on eBay UK regarding the new EPS (eBay Premium Service Badge. Small business loans, business funding, working capital and quick cash loans? The terms are many and they may not always be easy to understand. So which is which and more importantly, how do you know which is right for you? I’m going to start out by giving you the worst answer ever. It depends. As always it depends on the situation and even within the same business it may vary. So let’s take them one at a time… While there are many more than this article covers, the terms covered below should be the most relevant for you. When you’re considering what type of loan to take out there are two things to consider. Where can I find capital and what do I need it for? Bank loan: taking a bank loan is probably the first thing many businesses think of when they’re in need of capital. While many small businesses are finding it extremely difficult getting capital from their banks in terms of loans, an overdraft facility can turn out to be a good idea. To some having an overdraft facility equals bad finances, but that doesn’t have to be the case. In fact, having access to the overdraft can remove some cash flow restraints from your business. Remember, the overdraft is not there for you to use it all the time, but can become extremely valuable in some situations. Quick cash loan: Also known as pay day loans. Pay day loans are known for their extremely high interest rates and not necessarily very favourable terms. Taking a quick cash loan for your business is something you need to consider a lot before going into. Have you checked that all other options are ruled out? Are you sure that you can pay it back and that the cash will actually benefit your business? Small business loan: a small business loan can vary a bit, but usually refers to small loans for small businesses, i.e. no more than £15,000-£20,000. Some banks offer small business loans for start-ups, provided you have a decent business plan and a proper budget in place. This is a good idea to have in any case, to make sure your business will be sustainable if it works out the way you hope. For online sellers there are now other opportunities. Several companies are starting to specialize in niche sectors of the market, providing business loans tailor made for that specific industry. Benefits can be easier access to cash and a better understanding of your business. However, be aware that most of these loans will be short term, i.e. for no more than six months. Therefore, it’s important that you make a plan for the use of the money before taking them out, considering how you can maximize your profit within that period of time. Business funding: Business funding often refers to outside funding, either in terms of investment or just plain financial help. To gain outside funding can be quite difficult in the sense that it takes a lot of work and some luck as well. You should have a very creative approach, or it will be practically impossible. Here you should consider whether the work is really worth the capital, obviously depending on the amount of money you’re after. Government funding: Governments around the world have set up schemes to support start-ups in order to boost the economy. Depending on your country of residence you will probably be able to get access to a small loan to help you start your business. However, most of these loans are for start-ups only and not created to help established businesses grow. Companies will happily talk to you and tell you about their product. It’s important that you take your time to figure out which is the right way for you and the way to do that is by looking around, talking to different companies and consider the different benefits in accordance with your business needs. There are many advantages of being an online retailer. You build your own job, you can watch your business grow and well, you’re an entrepreneur. Which is pretty cool. The only downside there can be is that most online sellers are one their own. And sometimes that can get a bit lonely. Luckily, there are plenty of places to look to for company, especially online. Here you can find lots of advice, share concerns (and sometimes anger), success stories and just be friendly. There are specific groups and forums for eBay sellers and broader forums for the wider e-commerce community. For that reason it’s a good idea to look around and maybe be a member of more than one forum. LinkedIn has several groups. I am personally a member of eBay Sellers and eBay Sellers UK. I do enjoy the UK site more, because there are many country specific rules and you therefore feel more ‘at home’ in the UK group. While there aren’t a lot of posts in there all the time, LinkedIn has this great function where they send you an e-mail once in a while and inform you of what has been going on. You can also receive an e-mail whenever someone comments on a post you’re active in. An obvious one is The Wholesale Forums. Here you have more than 100,000 retailers or wholesalers sharing information and questions. Lace, who works for TWF, is always very helpful and will do her best to make sure you get the right answers. And then of course there are all the very active members who are very helpful. The members discuss everything from design to finance and social media. Are you a member? We recently started a Facebook group for Online Sellers in the UK. The group is only a few weeks old, but already has 150 members. The activity is mind-blowing, and this type of group works well if you need quick replies. There are a lot of experienced sellers and they tone is very informal and it’s an easy way to take part in a community without too much effort (since most people are on Facebook anyway). If you’re sick of being online, and simply just want to get out of the house, the UK online seller meetups have been happening since May 2012. At every meetup more people are showing up and enjoying a few talks from industry experts and some free drinks. It’s a great excuse to get out of the office and meet some fellow online sellers. These are only a few of the groups and forums you can join and there is no longer any excuse not to interact a bit. Well, if you want to. 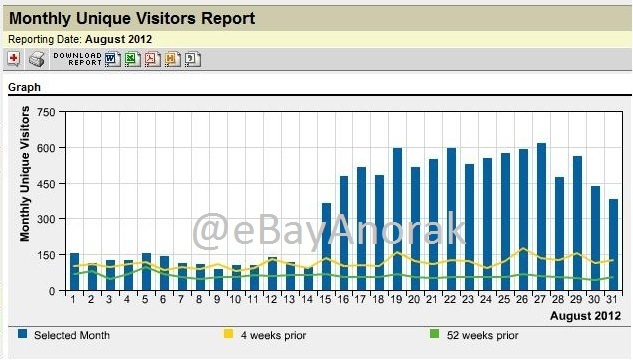 How’s your eBay Shop traffic Lately? As noted in previous posts I share lots of free advice when I’m out and about, purely due to me being a total Anorak when it comes to eBay, my chosen obsession and career path. My short presentation on Understanding eBay’s Best Match search and how to get the best from it at the iwoca sponsored Manchester UK Online Sellers Meetup went down very well with some really encouraging comments. I enjoy sharing tips during conversation I talk a lot but if I am sharing some of this stuff for free, why would someone want to pay me for it? Why have a consultancy day? As I’ve said many times while the basic principles of eBay selling is the same when it comes to eBay businesses one size does not fit all, different products, categories, back end processes, feedback all are different and there’s more to it than ‘how to list on eBay’ etc. I had a conversation with John Pemberton from DesignerClothing2U he said I should show a little of what I do for eBay for business sellers so I’ve chosen to share this picture with you all as an example. This is the traffic to a client’s eBay shop, a suggested change was made among others and the result is plain to see ‘click to embiggen’ should you require. The increase in eBay shop traffic was immediate, this is one example of the many changes I may suggest. My goal is to increase traffic yes, but also save you some fire fighting time in the everyday process of eBay selling, time is money but also better spent in growth of your business rather than fighting day to day processes. All advice will go toward increasing your sales, that is the part that takes some extra time and hard work on your part but on a more enlightened targeted path. If you are looking for someone to come in do a few clicks and make you millions it’s not me, if you want a get rich quick scheme, that’s not me either and anyone who tells you they can do this is lying. Do I know everything about eBay? No, but does any one person really know everything about this global online marketplace? One thing I can say is that I live and breathe the site twelve hours a day seven days a week I’m not called the eBayAnorak for nothing. I love to learn whatever I can about the site, learn the nuances of eBay. No one knows your business like you do, I know the ins and outs of eBay so I work with you to bring the two together to meet somewhere in the middle to make the best of both. On a day’s consultancy you won’t see any PowerPoint presentations as again your business is different form any other, all work is bespoke in a discussion like format and although my preparation work, set things to discuss and previously written notes etc are used during the day, all is bespoke and organic to you, your business and processes. I may tell you things you don’t want to hear, I’m not a yes woman, you pay me to give you advice, I’m going to do that but whatever I recommend there are hard and fast, tried and tested evidence behind it. I will show you how to use Best Match search to your advantage rather than the typical things I find where sellers actually scupper their search standing through their usual day to day selling processes.